This very hungry caterpillar eats words! It’s a “word-apillar”, with 3 head options. I use this craftivity as a super-fun way to build vocabulary and practice whatever “word work” I want to reinforce: Dolch & Fry sight words, word-family words, seasonal words etc. I’ve included a list of 31 “word work” ideas. Teachers can make masters of whatever words they want, laminate, trim and glue together. Hang the word-apillars up as a fresh, spring word wall. Turn off the lights, give a child a flashlight and have them shine it on one of the caterpillars, reading each word. For extra pizzazz, print the word circles on white paper then glue them to bright colors of construction or printed scrapbook paper circles. I made different word-apillars on a variety of colors, so my kiddos can easily differentiate. For a whole-group game, make extra word-apillars, but don’t glue the body-segment circles together. Put Velcro dots or magnet buttons on the back, so you can “build” a word-apillar. Pass the word circles out to your students. Call for a word. The child holding that circle shows it, reads it, everyone reads it together, then they fasten it to your flannel or white board, behind the caterpillar’s head. Children could sort your “word family” circles (the -at family is included & pictured) as an independent center, or have students put the words in alphabetical order. Play the “Word Wizard Word-apillar” game. Directions included. Finally, as a whole-group craftivity, children can make their own word-apillars. Completed projects make a sweet spring bulletin board or hallway display. 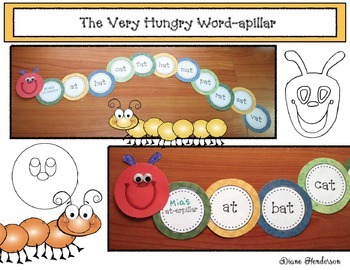 I’m Diane from Teach With Me, hoping your kiddos enjoy practicing word work with a crafty little word-apillar. Click on this link to see more Butterfly & Caterpillar activities. Click on this link to see more Word Work activities.